Happy Cyber Monday Ladies!! Every year I get super excited for this day (aka: The biggest online shopping day of the year) because there are always so many amazing deals to be had and this year certainly did not disappoint!! Most retailers are also offering free shipping on any size order (and some offer free returns too), so there really couldn't be an easier way to snag a deal! 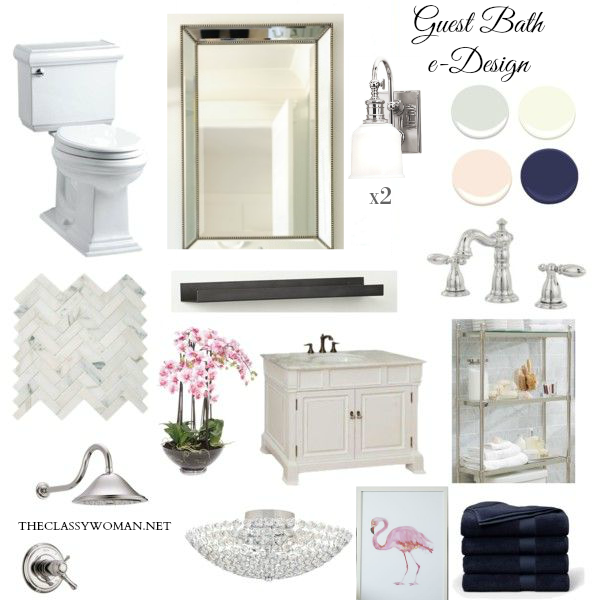 With that said, today I'm sharing my very favorite items above in the collage along with a full list of my favorite stores below and the accompanying details including promo codes, making things easier for you, so you won't have to dig through e-mails or hop from site to site trying to figure out where to begin. If you're truly at a loss on what to get certain family members or friends for Christmas or the holidays, Amazon is always a great place to look for inspiration! 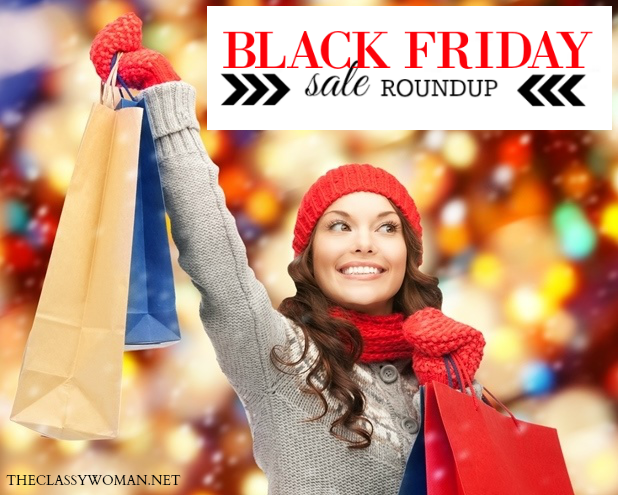 They have tons of deals on everything today so it's a great place to get the creative juices flowing and help you think outside of the box this year. I'm a huge fan of both giving and receiving monogrammed gifts. They add an extra-special personal touch. AMAZON // Tons of amazing deals in every category for everyone on your list! In past years, when I first moved to the U.S., I thought it would be so much fun to partake in Black Friday by getting up at the crack of dawn and heading from store to store braving the crowds in search of spectacular deals, ones that would help me stay on budget and allow me cross items of my holiday giving list. I can honestly say in the 2 years that I tested that out, I never really came away with anything all that spectacular, but instead came home exhausted, crawling in bed for a nap and wondering what I was thinking. I'm glad I got to experience this annual tradition for many, however this year (as with the past many), you'll find me at home in cozy holiday PJ's, with a cup of hot cocoa in hand and Hallmark Christmas movies on in the background while I peruse all the great deals online in the comfort of my own home-that's more my style. The top row of items are my picks from the 75% off sale and bottom are the 25% off sale. Kate Spade is known for their amazing luxury gifts, be sure to check out their Gift Guides and take a peek at their gifts Under $50, if you're looking for great stocking stuffer ideas! I love a one-stop shop and Nordstom always has the best gifts, it's one of my favorite stores. Above I'm sharing my favorite beauty + skincare along with activewear picks, perfect for giving gifts, stocking a stuffing or getting ready for the new year in a fresh way. If you've always wanted the Clarisonic skin cleansing system (a great gift for your mom or girlfriends too), it's now just $79! Also, this designer Saint Laurent clutch is 30% OFF which never goes on sale! Quality, well-made luxury pieces never go out of style! Tory is known for her tunics, handbags and of course her riding boots and flats. I'm liking these sunglasses as well as these. Don't forget to take a peek at the sale section as your 30% OFF applies to those items too! Anthropologie always has standout clothing items along with beautiful and unique home decor. If you're decorating for the season, refreshing your space or are in need of a pretty dress for a an upcoming holiday party (this dress is a showstopper in my opinion!) or the perfect jewelry, they've got such great selections. I'm sharing my favorite picks from the sale above. If you haven't even looked at their holiday decor and ornaments, they have the cutest, unique pieces that you won't find elsewhere! LOFT: 50% OFF everything Fri-Sun! 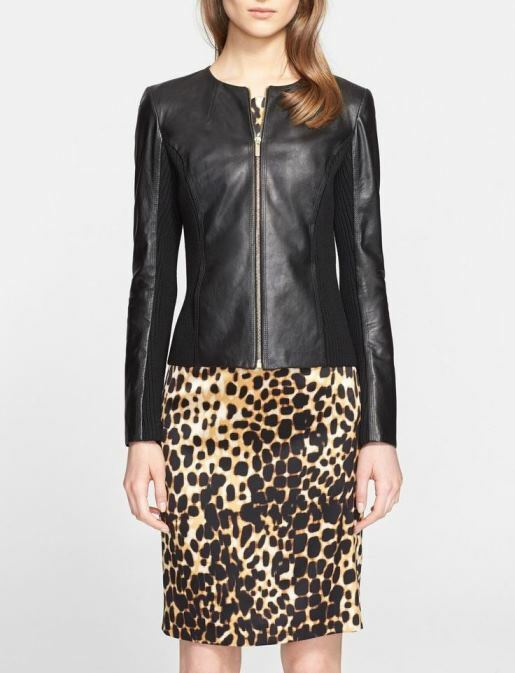 NEIMAN MARCUS: Up to 60% OFF! OLD NAVY: 60% OFF hundreds of styles, 50% OFF even more, 40% OFF everything else. SOLE SOCIETY: 30% OFF all shoes today only! Thanks for stopping by and Happy Black Friday Shopping! Every classy woman should have the goal of building a timeless wardrobe of quality-made pieces that can be worn for years to come, this of course includes classic jackets + coats to complete her overall look. 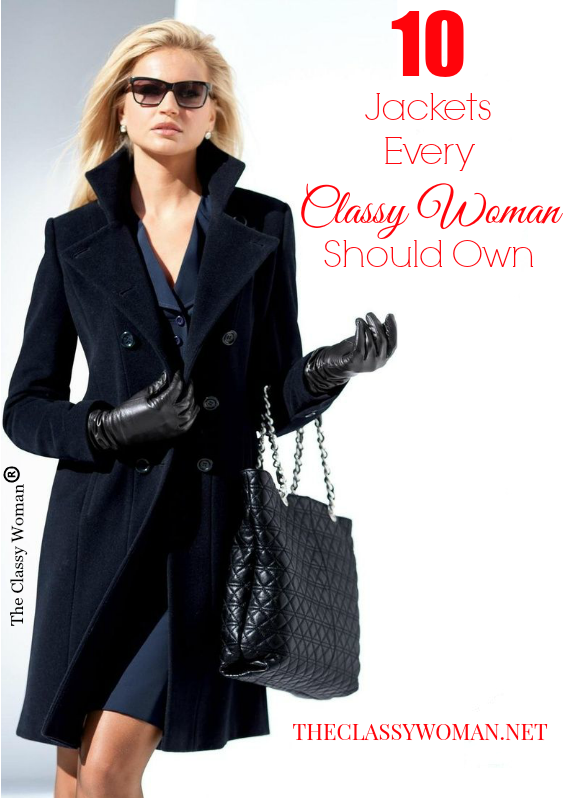 I'm taking the guess work out of which types of coats to invest in by sharing with you: '10 Jackets Every Classy Woman Should Own'. While it's true that you may be able to get away without owning a few of these, I can guarantee that times will pop up in life where you will wish you had them on hand and you'll realize what a perfect complement to your outfit they would be as well as the most appropriate choice for where you're headed. As you're adding to your closet over time, start with the jackets that make the most sense for your current everyday lifestyle, then add the others in as time and money permit. Whenever possible, always buy the best quality that you can afford at the time. When comparing, consider the materials used, being mindful of what needs to be dry cleaned. If it's a light colored cotton coat, you could be spending quite a lot more for regular cleanings. When choosing a color, remember that neutral tones will be much more versatile and will therefore give you the most return on your investment. Look inside the jacket,high quality coats and jackets will always be fully lined, usually with a beautiful complementary fabric and color (it may also have a fun burst of color as a contrast). When inspecting the workmanship, ensure there are no loose buttons or threads hanging and that stitching appears to be sturdy and taut. When trying on any jacket, make sure to button it up all the way as well as leave it opened up to see how comfortable it is. Try sitting down in the jacket and also moving your arms to reach, bend down and see how tight it is across the back and shoulders, paying attention that the arm length is appropriate and meets your wrist. Sleeves that are too long can always we tailored if you happen upon an amazing jacket otherwise-they should be slightly longer than your wrist when arms are at your sides. Lastly, a coat is an investment, fit is paramount, do try any jackets on with a variety of layers. In colder months thick sweaters may be worn under and especially for longer dressy coats, a suit may be worn underneath-make sure your jacket accommodates those extra layers. *I'm linking to jackets at a variety of price points below for every type listed, you can use the rotating scroll bar below each jacket to click on several different variations which will take you directly to the item sources. 1. Classic Trench Coat: I can think of no better jacket than a trench coat to take you through the unpredictable weather between seasons. 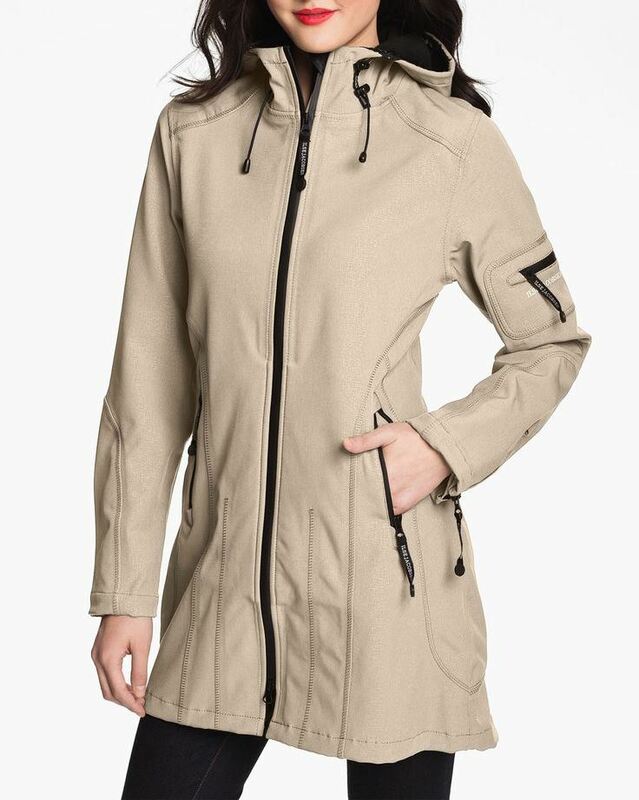 It is the perfect jacket for layering up, particularly in the spring and fall months. Best bets are classic light tan, camel or black. You can wear the belt buckled as it comes, however tying it up at the waist in a knot is generally the preferred method. They come in varying lengths, to get the most use you'll want to grab one that sits between mid thigh and above the knee. 2. 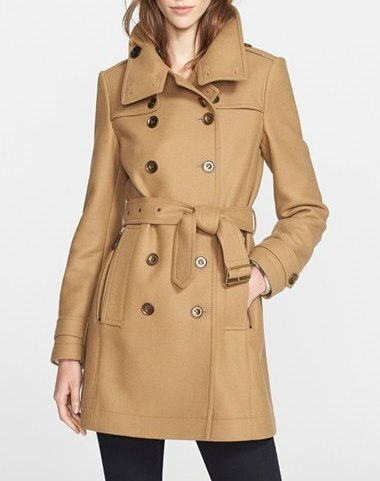 Wool Peacoat: Another timeless coat that you will wear with skirts, jeans, dress pants and so much more is a wool peacoat. It will also keep you warm and stylish, you'll likely find that this is one of your most worn jackets. Charcoal gray, medium gray, black and camel are the best choices in terms of versatility but a pop of color such as red or royal blue liven up the most dreary of days. 3. Well-Fitting Blazer: A solid black or navy blazer is the perfect way to dress up an outfit, particularly when paired with denim! They aren't just for the workplace. They instantly provide a polished and put together look no matter what you're wearing. While there are several styles of blazers such as larger boxy boyfriend style and shorter tweed styles, if you can only afford to add one, make it a black blazer that was made for your body-make sure it fits perfectly. This will differ slightly from woman to woman given overall body shape, you may find you prefer one that hits slightly below the hip, some a little longer or shorter. They can be worn with sleeves full length and cuffed up for a more edgy or casual look. I'm loving this black velvet tuxedo blazer, for a different look. 4. Puffy Jacket or Parka: Cold weather calls for serious outerwear, but that doesn't mean you have to sacrifice style because you're in the midst of a snowstorm. Staying warm and dry trumps all other factors in my opinion. A beautiful parka with fur-lined hood or a puffy jacket with necessary built-in insulation will keep you comfortable and prepared for the day instead of wet and freezing for the sake of fashion. 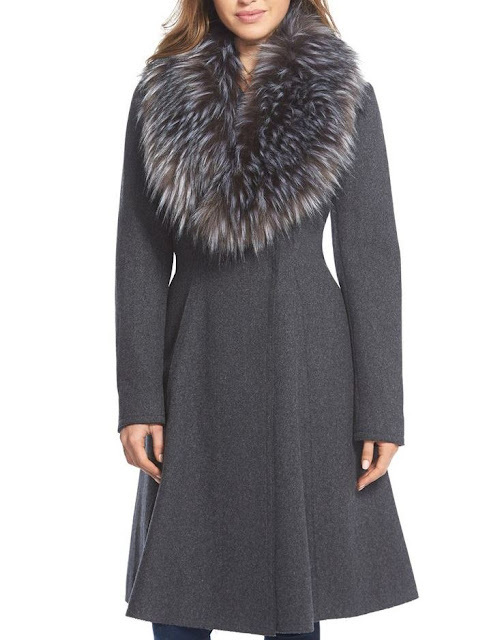 Note that a fur-lined hood can frame your face in the prettiest way without squashing your hairdo. This winter white puffy parka is so pretty. 5. Rain Jacket: A rain coat tends to be a category that many omit or see as unnecessary at times but it is indeed important to have on hand for rainy season. We all have those drizzly days spent outdoors watching a game or when rushing from store to store running errands in the pouring rain. No leather, suede or even wool jacket will hold up well when becoming utterly soaked, instead opt for a true raincoat with a hood that still looks cute and while you're at it, now's the time to rock a pair of rain boots because they are not only practical but they just so happen to be on trend too! This is my favorite pair and I love that they come in lots of colors. 6. Leather Jacket: A basic leather jacket has its own look that no other jacket can really pull off- a bit edgy, a bit casual but still polished and luxurious whether belted, buttoned up or zipped. While you can never go wrong with black or brown leather, I also love the look of blush, cream, pale gray or soft taupe tones to soften it up and provide a more feminine appeal. If you're buying a leather jacket for the first time, the safest bet is black, however if the majority of your wardrobe revolves around brown as it is better suited to your skin tone, begin there. 7. Long Dressy Coat: One of the most important coats to have on hand and at the ready is a special events or long dressy coat for formal affairs. Think: the Opera, a fancy dinner at a 5-star restaurant or a holiday church service. 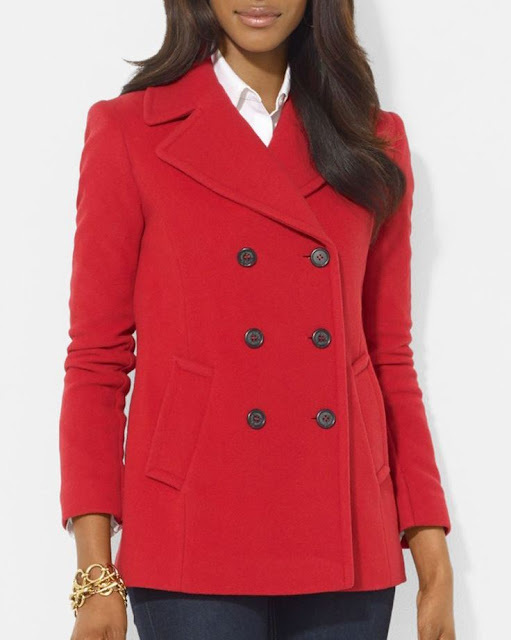 A dressy coat is always knee-length or slightly longer to mid-shin and has an elegant polished ladylike look. Be sure to invest in a dark staple color such as black, charcoal gray or navy to get the most wear and maximize your investment. This coat can also double as a day-to-day coat for the office and/or meetings in the coldest months matching the length of a long skirt or dress and naturally pairs well with heeled knee-high boots. The one in my own closet is charcoal color wool and I've owned it for over a decade (nearly identical to the one shown in the very top image). It is my go-to for so many different occasions and is still in style not to mention in excellent condition all these years as I invested in quality. 8. 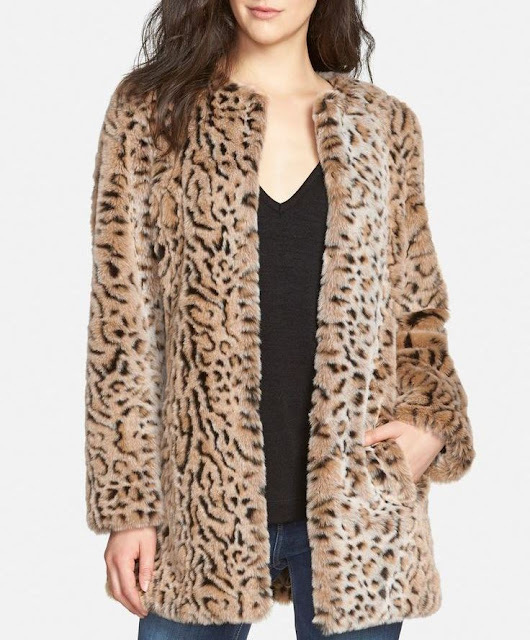 Leopard Print or Bold Color Coat: Not all jackets need to be so serious and practical, a bold color coat, striped coat, plaid coat, or leopard print jacket adds personality, dimension and some fun into your wardrobe. If you have a favorite color that compliments your skin tone well such as pink or red for example (those are my colors), it will lift your spirits and you'll stand out in a good way in a sea of gray, tan, black and navy. Leopard print is now considered to be a neutral, a playful one at that which can be worn day or night for both casual and dressed-up looks. I love this blush coat, this red coat and this leopard print coat. 9. Fluffy or Furry Jacket: For evenings out on the town or heading to a club or cocktail party, a fun alternative to traditional coats which adds softness, luxury as well as a feminine quality is a fluffy or furry coat (usually shorter in nature) sitting just below the waist, it's the perfect way to complete an all-black look when the jacket itself is in a lighter color such as blush pink, pale gray or cream. 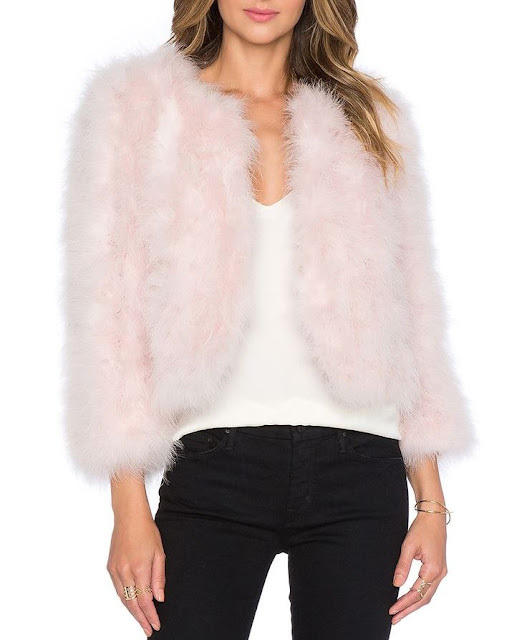 For this style of jacket I particularly like soft pink furry coats (this one is a favorite! )-they're so ladylike! 10. Denim Jacket: Last but not least, as utilitarian looking as it may be, denim jackets need not make you look like you work on a farm. Instead, they are the perfect way to complete a casual, relaxed look that is not too fussy. Opt for one that has a bit of stretch to it and is of a slightly softer cotton and is more form fitting vs. a bulky, structured rigid jacket. 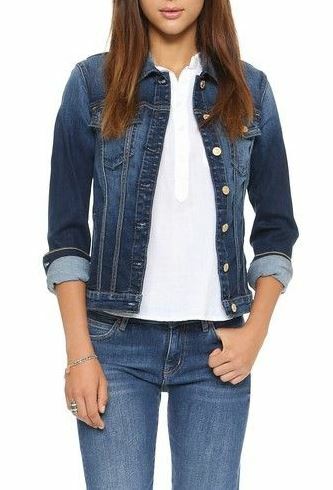 Remember, jean jackets come in more colors than indigo blue-some of my favorites are white denim and black denim but a classic blue denim jacket is a staple in every woman's closet so start with that color and build from there. I love this super dark indigo moto denim jacket. What are our thoughts on jackets & coats? Are there any that you realize you could benefit from owning in your own wardrobe? Do you have a go-to that you wear more than any other to work or during weekends? Share with us in the comments below. Like any noble goal in life, profession or anything worth having, becoming a classy woman takes hard work; dedication, discipline, time, self-correction, self-awareness, a desire for personal growth and the need for constant refinement. 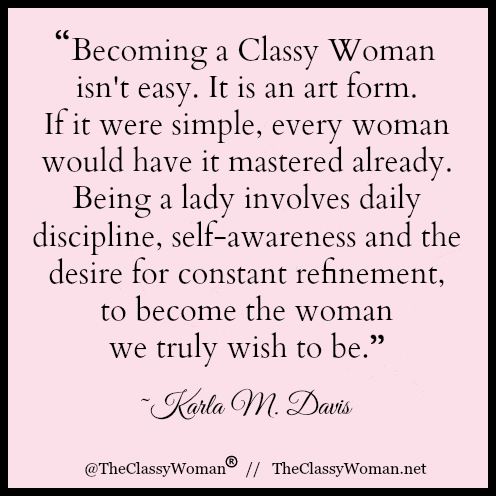 Being a classy woman truly is an art form and it isn't easy. If you've been working on yourself and making progress but feel as though you have such a long way to go, I just want to encourage you today and let you know that I do also-you are not alone! Even though I write a blog on the very topic of what it means to be a classy woman, I still struggle in many areas of my life with such things as impatience and I am not always as gentle as I could be (or desire to be) and sometimes I utter words that I reflect on afterwards and wish I had conveyed differently. At times I have questioned whether I should continue to write such a blog but every time I remind myself that I need to hold myself to a standard of grace and not perfection. If I want to extend such grace to others, it needs to begin with myself first. 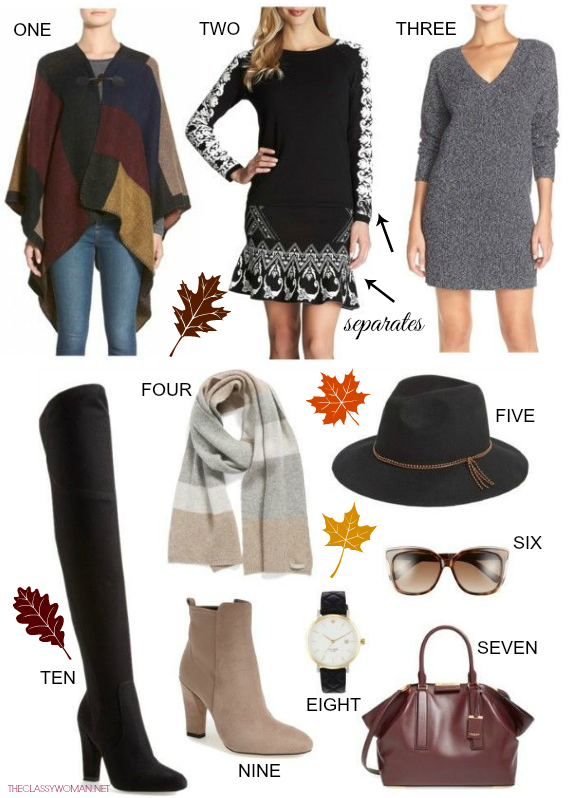 Thanksgiving Outfit Ideas: All Looks on Sale! It's hard to believe that Thanksgiving is just a few weeks away! With that in mind, I wanted to share some outfit ideas with you and the best part is all of the pieces I'm including are on sale!! With the Nordstrom Fall Clearance Sale currently running, you can get several pieces up to 50% off! Now is the perfect time to plan what to wear so it will arrive with time to spare. By the way, how cute is this tote for under $40 that comes in 3 colors?! Thanksgiving tends to be warmer for us here in Florida, however some years have been surprisingly chilly which is always a welcomed change. I typically gravitate towards wearing a skirt + blouse for a more dressy affair, or a sweater dress with tall heeled boots for an edgier look. When we're at home or invited to our in-laws' home and want to dress more casual, I love wearing jeans with a tee (short or long sleeved), topped with a cape/poncho, blazer or cozy sweater along with riding boots. The key is to wear comfortable clothing since it will be a day of feasting on yummy treats! Wearing an outer layer is a great way to hide a bit of a post-dinner tummy. I think this leather pocket sweater with these black skinny jeans would make a cute and stylish casual outfit. Even if you aren't buying for Thanksgiving, it's worth taking a peek at the sale. Items have been selling out really fast (there are a few pieces that I wanted to share here but they're already sold out) so if you see something in your size or favorite color, act fast! 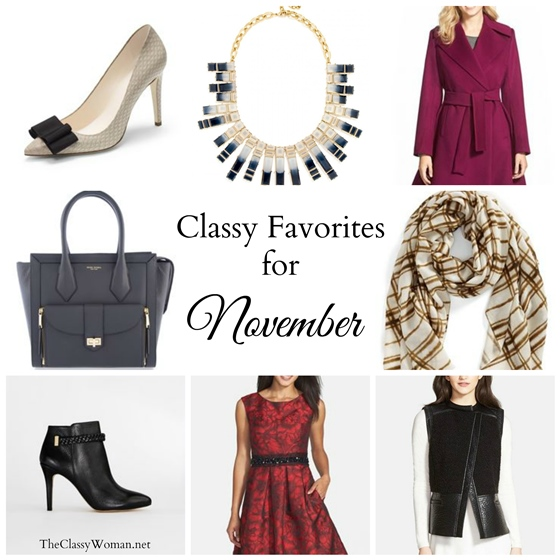 I'm back with another edition of Classy Fashion Favorites for this glorious fall season. As the temperature continues to drop (although in Florida I'm beginning to wonder if that's ever going to happen as our heatwave presses on! ), so too becomes the need for warmer clothing, layers, proper outerwear and boots. I believe neutrals are the basis of every wardrobe, especially in the cooler months so you'll see several of them here. 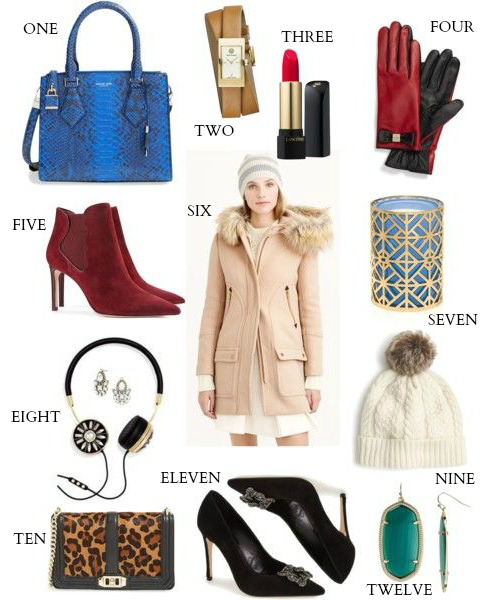 Above, via the boutique widget I'm sharing a collection of 80 favorite pieces that I've come across for the month with these 8 being on my immediate wish list. As always, I'm linking to all the best current sales for you below! Most of you have likely packed up your summer clothing now and have had a chance to take a little inventory of what's needed for the new season in your closet. Maybe you're lacking a great fall blazer, long sleeved tees, a pair of comfy go-to boots, a cozy sweater or a the perfect coat to polish off your daily look, whatever it is, there are a lot of great sales going on that will allow you to pick up those needed pieces at a great price. My favorite is the Nordstrom Fall Clearance Sale which includes everything for women, men, kids and the home with many items up to 40% off (I've even seen some for up to 50% off!) Be sure to check it out! You can see my recent 'Thanksgiving Outfit Ideas' post inspired by the sale. SAKS FIFTH AVENUE: Up to 40% OFF Designer selections via Sneak Peek Sale. WHITE HOUSE/BLACK MARKET: Pants & Sweaters are buy 1, get 1 50% OFF & up to 60% OFF sale items. Thanks for stopping by! What is on your wish list for fall?